The original story of Thumbelina is a strange fairy tale from the mind of Hans Christian Anderson that sees a tiny girl emerge from a flower only to be carried off by a toad, and once she has met various creatures, she marries a flower fairy prince. Symbols that look like they have come straight from an animated movie make the Thumbelina’s Dream video pokie stand out, as does the unusual reel style and unique bonus features. Created by EGT, this real money online pokie has an incredible 225 paylines running across the 6 reels, and while reels 1, 2 and 3 from the left side have just 3 symbols on each, the others are 5 symbols high. All lines are active at all times and can be played from a low limit of 50 coins, while bets can be raised to a maximum of 1,000. 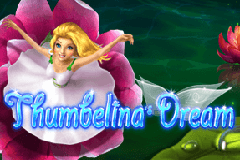 Free Thumbelina’s Dream video pokies are offered by most casinos, so anyone who likes to test their games out first may find this a useful option. While the symbols look very appealing, so does the overall design of the game, with lily pads floating in a pond behind the reels. All EGT pokies share a special 4-stage progressive jackpot feature, and the levels of this are displayed above the first 3 reels, while below is the game title in a nice blue design. Apart from the jackpots, there’s expanding wilds and a free spins game where extra spins can be added on, plus there’s the option to gamble any win of less than 1750 coins in a double or nothing side game. The fairy tale theme is carried throughout this pokie, where even the lower-value playing card symbols are styled in keeping with it. At the 50 coin level, the 10, J and Q symbols will pay 1 coin when either lands on reels 1, 2 and 3 across a payline, while 4, 5 or 6 on a line will be worth 3, 10 or 50 respectively. K and A symbols return wins of between 1 and 60 coins depending on how much of a payline each lands across, but it’s the unique pictures of fairy tale creatures that give this pokie such a charming appearance, as well as charming players by paying out the bigger prizes. There’s a violin-playing beetle, a smartly dressed frog, a dormouse cooking a pie, and a distinguished-looking mole, all of which turn up in the original Hans Christian Anderson version of the story. Top of the animal kingdom in this game is a swallow wearing a scarf and when this flaps onto a payline, it’s worth between 1 and 150 coins. Thumbelina herself is the wild symbol in this pokie, and while she only lands on reels 2 and 5, when she does so, she expands to the left and right, paying up to 250 coins while also being able to substitute for others and complete additional winlines, either by filling in the gaps in a line of matching symbols, or extending a win across extra reels. The other bonus symbol is the flower fairy prince, who appears on reels 4, 5 and 6 only, but pays out 50 coins when he does so, without needing to be across a payline. This also triggers 10 free spins, and if the prince appears again, an extra spin is added to the total number. An alternate set of reels in used throughout the bonus round, but the overall odds of getting a win remain the same as in the main games. If players choose to gamble a win, they will open up a screen where a playing card flashes from red to black and will need to click a button at the right time to match the colour, doubling the coins won if the timing is right, but of course, it’s a gamble, so a wrongly-timed click will lose the triggering prize. The Jackpot Cards bonus game can be awarded after any spin, win or lose, and once a player has entered this round they are guaranteed to collect either the Club, Diamond, Heart or Spade award. By clicking on the 12 face-down playing cards, the suits are revealed and once 3 of a kind have been found, the corresponding jackpot is won. This very attractive game has been designed with great attention to the details. The interesting reel layout should help players land a few more winning lines, while the unique expanding wild will certainly help. It’s not perfect however, as the relatively high entry point of 50 coins, along with the fact that it’s not mobile-optimised could put some potential players off, but for those who don’t mind these points, it’s a great online casino pokie.